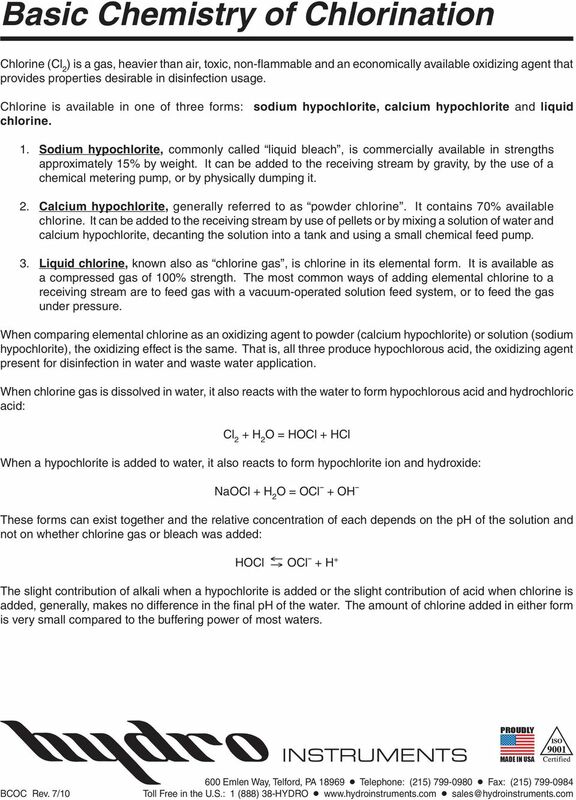 Download "Basic Chemistry of Chlorination"
2 2 Basic Chemistry of Chlorination The ph of the water is important relative to the varying proportions of the hypochlorous acid and hypochlorite ions. In a solution with ph rising over 6.0 the proportion of hypochlorous acid declines from virtually 100% down to almost 0 at ph 9.0. The activity of hypochlorous acid as a bactericide is greatly superior to that of the hypochlorite, being almost 80 times more powerful. It may be concluded that in free residual chlorination, the higher the ph value the less active is the residual because of its lower proportion of hypochlorous acid. 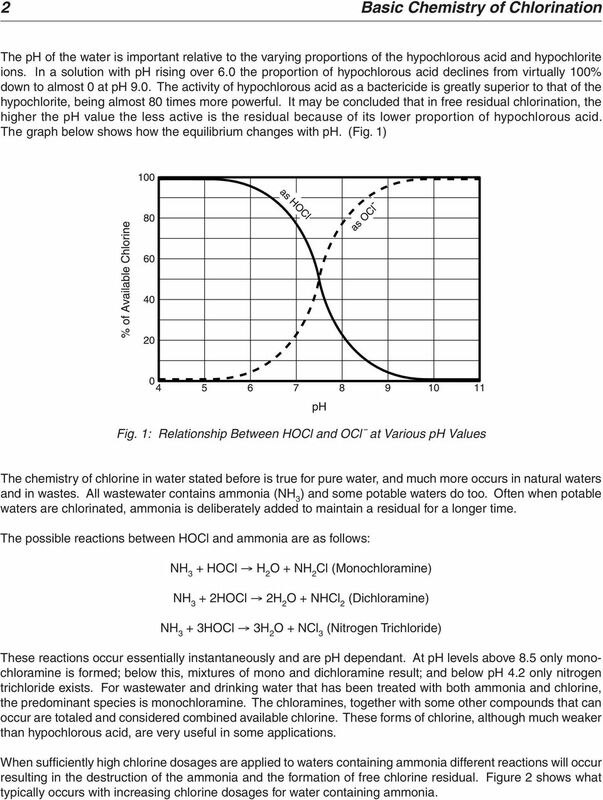 The graph below shows how the equilibrium changes with ph. (Fig. 1) Fig. 1: Relationship Between HOCl and OCl at Various ph Values The chemistry of chlorine in water stated before is true for pure water, and much more occurs in natural waters and in wastes. All wastewater contains ammonia (NH 3 ) and some potable waters do too. Often when potable waters are chlorinated, ammonia is deliberately added to maintain a residual for a longer time. The possible reactions between HOCl and ammonia are as follows: NH 3 + HOCl H 2 O + NH 2 Cl (Monochloramine) NH 3 + 2HOCl 2H 2 O + NHCl 2 (Dichloramine) NH 3 + 3HOCl 3H 2 O + NCl 3 (Nitrogen Trichloride) These reactions occur essentially instantaneously and are ph dependant. At ph levels above 8.5 only monochloramine is formed; below this, mixtures of mono and dichloramine result; and below ph 4.2 only nitrogen trichloride exists. For wastewater and drinking water that has been treated with both ammonia and chlorine, the predominant species is monochloramine. The chloramines, together with some other compounds that can occur are totaled and considered combined available chlorine. These forms of chlorine, although much weaker than hypochlorous acid, are very useful in some applications. When sufficiently high chlorine dosages are applied to waters containing ammonia different reactions will occur resulting in the destruction of the ammonia and the formation of free chlorine residual. Figure 2 shows what typically occurs with increasing chlorine dosages for water containing ammonia. 3 Basic Chemistry of Chlorination 3 Low chlorine dosages result in the formation of mono and dichloramine and are depicted as increasing residual on the left end of the curve (Fig. 2). The peak of the curve occurs when all of the free ammonia is used up forming chloramines. This usually occurs when the dosage reaches 8 or 10 times the ammonia concentration. This is called the breakpoint. After breakpoint the combined chloramines are present as free chlorine which is a mixture at normal ph values of hypochlorous acid and hypochlorite. Fig. 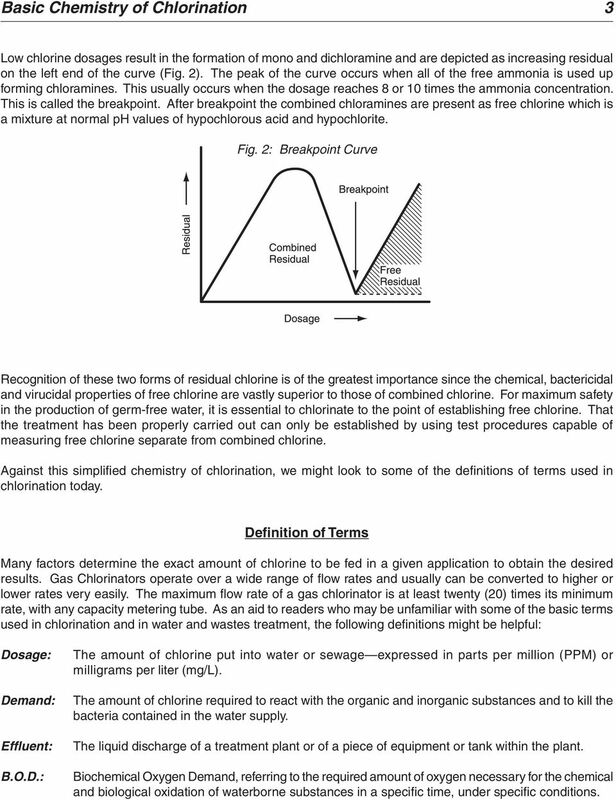 2: Breakpoint Curve Recognition of these two forms of residual chlorine is of the greatest importance since the chemical, bactericidal and virucidal properties of free chlorine are vastly superior to those of combined chlorine. For maximum safety in the production of germ-free water, it is essential to chlorinate to the point of establishing free chlorine. That the treatment has been properly carried out can only be established by using test procedures capable of measuring free chlorine separate from combined chlorine. Against this simplified chemistry of chlorination, we might look to some of the definitions of terms used in chlorination today. Definition of Terms Many factors determine the exact amount of chlorine to be fed in a given application to obtain the desired results. Gas Chlorinators operate over a wide range of flow rates and usually can be converted to higher or lower rates very easily. The maximum flow rate of a gas chlorinator is at least twenty (20) times its minimum rate, with any capacity metering tube. As an aid to readers who may be unfamiliar with some of the basic terms used in chlorination and in water and wastes treatment, the following definitions might be helpful: Dosage: Demand: Effluent: B.O.D. 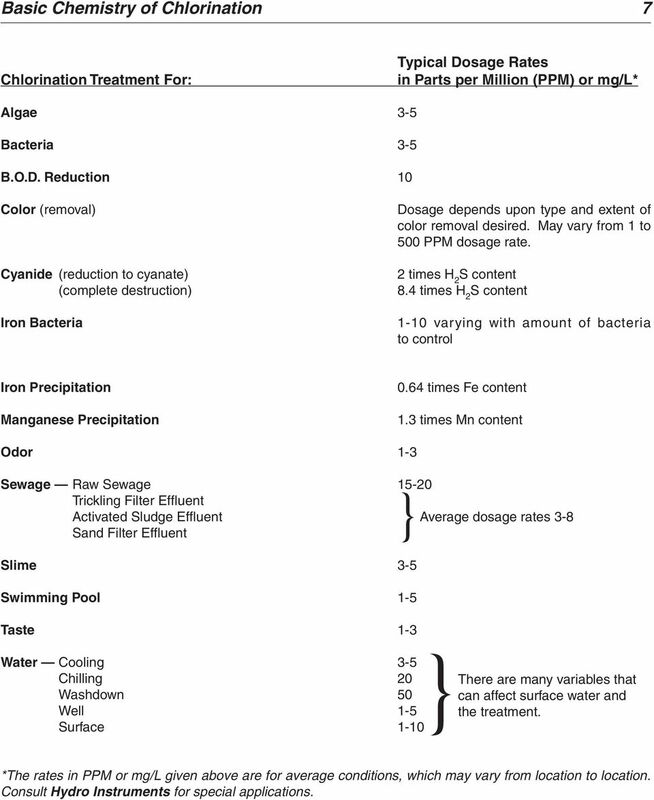 : The amount of chlorine put into water or sewage expressed in parts per million (PPM) or milligrams per liter (mg/l). The amount of chlorine required to react with the organic and inorganic substances and to kill the bacteria contained in the water supply. The liquid discharge of a treatment plant or of a piece of equipment or tank within the plant. Biochemical Oxygen Demand, referring to the required amount of oxygen necessary for the chemical and biological oxidation of waterborne substances in a specific time, under specific conditions. 4 4 Basic Chemistry of Chlorination PPD: PPM: Back Pressure: Pounds Per Day, referring to pounds of chlorine per day required to do a specific job (expressed in the metric system as Grams Per Hour = gr/hr, referring to the grams of chlorine per hour required to do a specific job). Parts Per Million, referring to pounds of chlorine per million pounds of water (expressed in the metric system as Milligrams Per Liter = mg/l, referring to milligrams of chlorine per liter of water). PPM and mg/l are numerically identical measurements. The line pressure in a pipe into which chlorine is to be injected plus the pressure drop in the solution line from the ejector to the point of application. Combined Chlorine Residual: That portion of the total residual chlorine remaining in the chlorinated water or waste at the end of a specified contact period, which will react chemically and biologically as chloramines or organic chlorine. Chlorine Residual: Available chlorine remaining after the reaction interval and still available to combat the more resistant organisms and to safeguard against any later contamination. Free Available Chlorine: That portion of the total residual chlorine remaining in the chlorinated water or waste at the end of a specified contact period, which will react chemically and biologically as hypochlorous or hypochlorite ion. Effectiveness of Chlorine Gas Versus Hypochlorites Chlorine is available in three forms: gaseous chlorine (100% pure), calcium hypochlorite (HTH) and sodium hypochlorite (bleach). When chlorine gas is dissolved in water, the reaction forms hypochlorous acid and hydrochloric acid: Cl 2 (chlorine gas) + H 2 O = HOCl (hypochlorous acid) + HCl (hydrochloric) When a hypochlorite is added to water, the reaction forms hypochlorite ion and hydroxide: NaOCl (sodium hypochlorite) + H 2 O = OCl (hypochlorite ion) + OH (hydroxide) Hypochlorous acid and hypochlorite ion are both disinfection agents. These forms can exist together, but their concentration depends on the ph of the solution. HOCl OCl + H + at 25 C and a ph of 7.5 (7 is average for water or neutral) half of the chlorine present in a solution of OCl and half is HOCl. At higher ph values, the quantity of OCl increases at the expense of HOCl and at lower ph values, the shift is toward conversion of OCl to HOCl. At a ph of about 5, nearly all the chlorine is present as HOCl, and at ph 8.5, nearly all the chlorine is present as OCl. In sanitizing water, hypochlorous acid (HOCl) is times more effective as hypochlorite ion (OCl ). Chlorine gas lowers the ph of the solution, thus more HOCl is present and many times more effective. At ph 7 (neutral), 76% of the chlorine is in solution as HOCl. 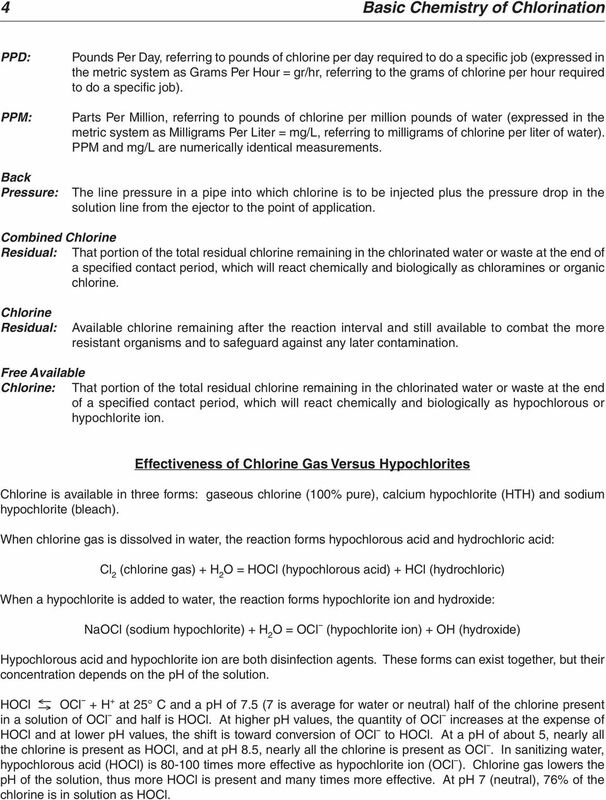 5 Basic Chemistry of Chlorination 5 Hypochlorites raise ph, losing its effectiveness. In hard water, this may contribute to deposits on equipment and residues. Hypochlorites also produce CaCl 2 or NaCl (salt) which may have an adverse effect on the quality of the water or solution. Hypochlorites are more sensitive to organic matter in the water and thus lose their germicidal powers faster. Applications Drinking Water Proper application of chlorine will produce bacteria-free water and eliminate algae and slime. Treatment of ground water (well, spring, etc.) for small to medium sized systems normally requires nothing more than simple chlorination for the effective removal of small amounts of hydrogen sulfide and elimination of iron bacteria (crenothrix) associated with objectionable odor and taste. Chlorination of surface water (lakes, rivers, etc.) may be more difficult and can require combined methods of chlorination such as breakpoint, chlorine-ammonia, superchlorination, etc. In some water, chlorine alone, maintaining a free residual, will completely eliminate objectionable taste and odor. Industrial Process Water Process water that becomes part of an end product, such as in the canning and bottling industries, must be odor and taste free. Bacteria of all types must also be destroyed prior to use. All such water (from private wells or a municipal source) should be chlorinated from 2 to 5 PPM or higher, but normally there is no need to dechlorinate. 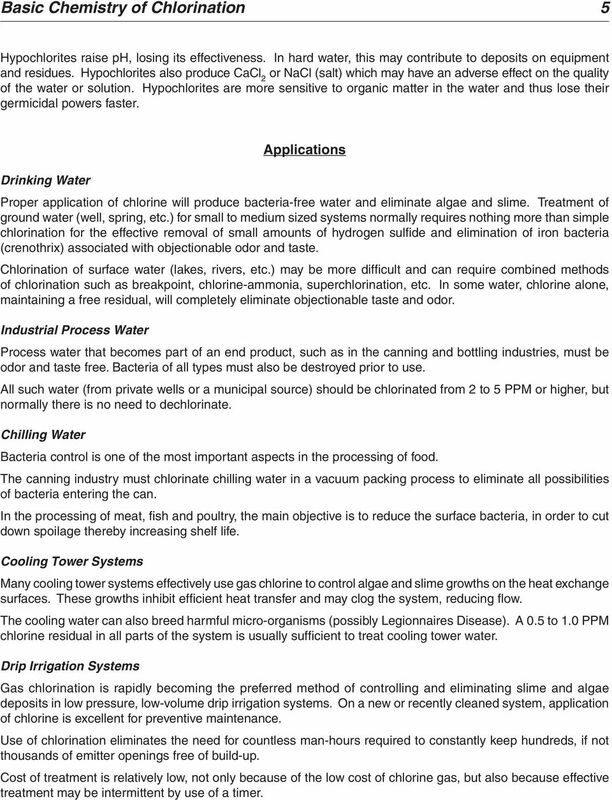 Chilling Water Bacteria control is one of the most important aspects in the processing of food. The canning industry must chlorinate chilling water in a vacuum packing process to eliminate all possibilities of bacteria entering the can. In the processing of meat, fish and poultry, the main objective is to reduce the surface bacteria, in order to cut down spoilage thereby increasing shelf life. Cooling Tower Systems Many cooling tower systems effectively use gas chlorine to control algae and slime growths on the heat exchange surfaces. These growths inhibit efficient heat transfer and may clog the system, reducing flow. The cooling water can also breed harmful micro-organisms (possibly Legionnaires Disease). A 0.5 to 1.0 PPM chlorine residual in all parts of the system is usually sufficient to treat cooling tower water. Drip Irrigation Systems Gas chlorination is rapidly becoming the preferred method of controlling and eliminating slime and algae deposits in low pressure, low-volume drip irrigation systems. On a new or recently cleaned system, application of chlorine is excellent for preventive maintenance. Use of chlorination eliminates the need for countless man-hours required to constantly keep hundreds, if not thousands of emitter openings free of build-up. Cost of treatment is relatively low, not only because of the low cost of chlorine gas, but also because effective treatment may be intermittent by use of a timer. 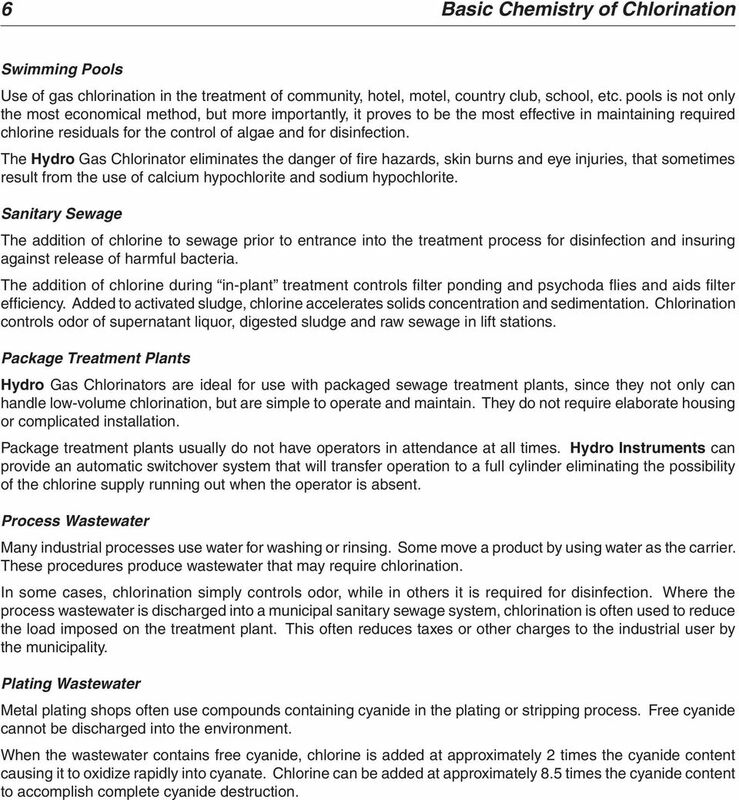 6 6 Basic Chemistry of Chlorination Swimming Pools Use of gas chlorination in the treatment of community, hotel, motel, country club, school, etc. pools is not only the most economical method, but more importantly, it proves to be the most effective in maintaining required chlorine residuals for the control of algae and for disinfection. The Hydro Gas Chlorinator eliminates the danger of fire hazards, skin burns and eye injuries, that sometimes result from the use of calcium hypochlorite and sodium hypochlorite. Sanitary Sewage The addition of chlorine to sewage prior to entrance into the treatment process for disinfection and insuring against release of harmful bacteria. The addition of chlorine during in-plant treatment controls filter ponding and psychoda flies and aids filter efficiency. Added to activated sludge, chlorine accelerates solids concentration and sedimentation. Chlorination controls odor of supernatant liquor, digested sludge and raw sewage in lift stations. Package Treatment Plants Hydro Gas Chlorinators are ideal for use with packaged sewage treatment plants, since they not only can handle low-volume chlorination, but are simple to operate and maintain. They do not require elaborate housing or complicated installation. Package treatment plants usually do not have operators in attendance at all times. Hydro Instruments can provide an automatic switchover system that will transfer operation to a full cylinder eliminating the possibility of the chlorine supply running out when the operator is absent. Process Wastewater Many industrial processes use water for washing or rinsing. Some move a product by using water as the carrier. These procedures produce wastewater that may require chlorination. In some cases, chlorination simply controls odor, while in others it is required for disinfection. Where the process wastewater is discharged into a municipal sanitary sewage system, chlorination is often used to reduce the load imposed on the treatment plant. This often reduces taxes or other charges to the industrial user by the municipality. Plating Wastewater Metal plating shops often use compounds containing cyanide in the plating or stripping process. Free cyanide cannot be discharged into the environment. When the wastewater contains free cyanide, chlorine is added at approximately 2 times the cyanide content causing it to oxidize rapidly into cyanate. Chlorine can be added at approximately 8.5 times the cyanide content to accomplish complete cyanide destruction. 7 Basic Chemistry of Chlorination 7 Chlorination Treatment For: Typical Dosage Rates in Parts per Million (PPM) or mg/l* Algae 3-5 Bacteria 3-5 B.O.D. Reduction 10 Color (removal) Cyanide (reduction to cyanate) (complete destruction) Iron Bacteria Dosage depends upon type and extent of color removal desired. May vary from 1 to 500 PPM dosage rate. 2 times H 2 S content 8.4 times H 2 S content 1-10 varying with amount of bacteria to control Iron Precipitation Manganese Precipitation 0.64 times Fe content 1.3 times Mn content Odor 1-3 Sewage Raw Sewage Trickling Filter Effluent Activated Sludge Effluent Sand Filter Effluent } Average dosage rates 3-8 Slime 3-5 Swimming Pool 1-5 Taste 1-3 Water Cooling 3-5 Chilling 20 }There are many variables that Washdown 50 can affect surface water and Well 1-5 the treatment. Surface 1-10 *The rates in PPM or mg/l given above are for average conditions, which may vary from location to location. Consult Hydro Instruments for special applications. 8 8 Basic Chemistry of Chlorination The Effects of Temperature and Time of Contact on Chlorine Disinfection The bactericidal power of both free chlorine and chloramines decreases with falling temperature. In a situation where the effects of lowered temperature and high ph value are combined, the reduction in the efficiency of free chlorine and chloramines is very marked. These factors have an important bearing, therefore, on the time of exposure necessary to achieve satisfactory disinfection. Under favorable conditions, the contact time required with free available chlorine may be only a few minutes; combined available chlorine under the same conditions, the final test of disinfection resides in bacteriological examination to ensure that the treated water complies with recognized standards. Calculating Chlorinator Size Chlorinator size should be based on the maximum expected flow rate at any time. Use Gallons per Minute (GPM) or Cubic Meters per Hour (m 3 /hr) rather than daily total or average. Water Use Supporting Guidance (WAT-SG-41) Discharge of Chlorinated Effluents Version: v2.1 Released: Aug 2014 Copyright and Legal Information Copyright 2012 Scottish Environment Protection Agency (SEPA). Disinfection Session Objectives To introduce the principal disinfectants that may be used and highlight key advantages and disadvantages of each To emphasise the use of chlorination for routine disinfection. Alkalinity Profiling in Wastewater Operations. OPS Challenge Laboratory Event 2015 Description and Procedure. Alkalinity Defined. PPM or ORP: Which Should Be Used? BOD / CBOD FROM A TO Z Amy Starkey Stark County Sanitary Engineers What is BOD???? What is BOD? It is a measure of the amount of oxygen consumed by bacteria during the decomposition of organic materials. Water may appear to be clean, but dissolved chemicals and microscopic bacteria could make you seriously ill if you drank it. DEIONIZATION IN A "NUT SHELL"
Aerobic Digestion: The breakdown of wastes by microorganisms in the presence of dissolved oxygen. Lesson Plan: How Do We Know What is Healthy Water? Sodium Chlorite Chlorine Dioxide Generators Introduction Chlorine dioxide enjoys many different types of use particularly in water treatment; among these is disinfection, bleaching, and chemical oxidation. SW Section AWWA. Use of Ozone for Disinfection and Mitigation of Disinfection Byproducts. Nathan Dunahee, P.E.